A realm of tranquility and pure, unpretentious Cretan hospitality, seamlessly blending the elements of Cretan tradition with the comfort of our facilities. At Hermes Apartments we tend to follow the rules of Cretan hospitality, in our dedication to make our guests feel as comfortable as home. A family oriented accommodation proposing a breadth of facilities, exuberant services that will sure lure guests into a dream-state of mind. 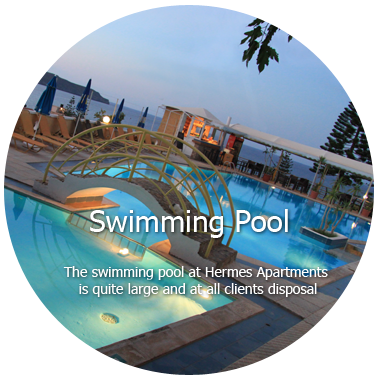 Hermes Apartments is located at Kato Stalos , just 7km west of Chania city center, 100m from the area’s magnificent sandy beach, on top of a small hill that offers an amazing view to the sea as well as to Chania. It has 14 rooms, specifically 12 two to three person studios and 2 apartments up to four persons. All rooms are spacious, well designed and cozy. At Hermes Apartments we tend to follow the rules of Cretan hospitality, in our dedication to make our guests feel as comfortable as home. Book directly with us and get a 5% discount! When you book through our website. Rates vary according to season. Stay period April-October. 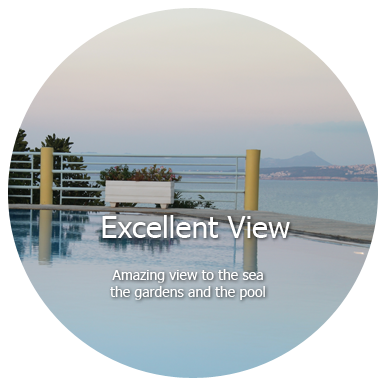 Hermes Apartments is located on a wondrous hill in Stalos village, just 7km from Chania city center and 100m from the area’s magnificent sandy beach, offering a spectacular view to the Cretan Sea.